The Land Portal Foundation and the NRMC Center for Land Governance partnered with key organizations to hold a series of three webinars leading up to the third annual India Land and Development Conference (ILDC), which took place from 12-14 March, 2019. The results of these webinars will inform discussions at respective panel sessions during the conference with the aim of making panel-conversations more nuanced while also ensuring deeper dives into the subject, thereby achieving more actionable results. The ultimate goal of these webinars is to contribute to desirable changes in institutional frameworks and to eliminating barriers that are limiting implementation of legal and policy frameworks, through enhanced awareness and understandings of stakeholders. In addition, these webinars connected local and global discourse and audiences, with the immediate outcome of enhanced and nuanced appreciation of the issue and more informed actions that contribute to better results. 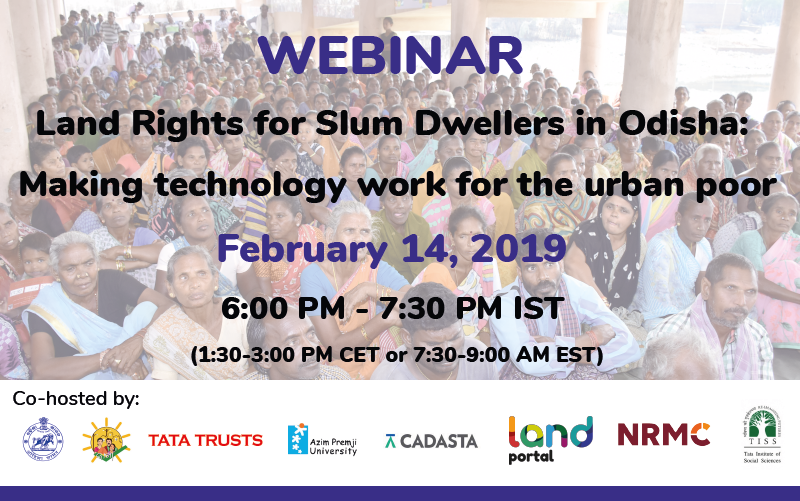 The webinar on Land Rights for Slum Dwellers in the East Indian State Odisha: Making technology work for the urban poor took place on 14 February. The webinar was co-organized by the Government of Odisha, Tata Trusts, Azim Premji University, Cadasta Foundation, Tata Institute of Social Sciences (TISS) with support from the NRMC Center for Land Governance and the Land Portal Foundation. Objective: The objective of the webinar was to discuss anecdotes of the land rights policy in the state, application of innovative technology, processes and partnerships in the project execution and best practices followed in gaining rights for slum dwellers.